Dariya doesn’t have a father. So, she needed a planted father for the wedding ceremony. Another former homeless addict Anatoliy became her planted father. Anatoliy also was found by Dariya and went through our Rehab program. Amazing detail – when Dariya sent Anatoliy to the Center, she said that he will be her planted father. It was a true prophesy! 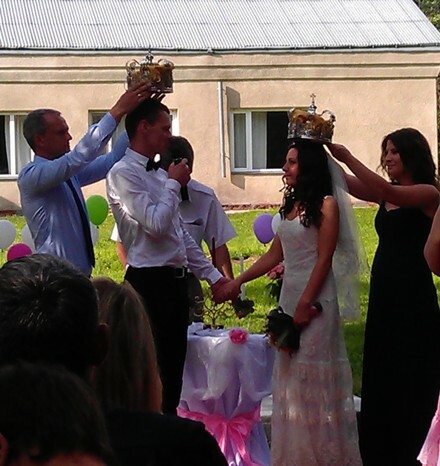 Yesterday we celebrated another wedding of Andrei and Olga. Andrei was a heavy drug addict for long ten years. He came to our Center, went through the program and became a faithful minister. He actually was my assistant during the last three years. Now Andrei is moving into new era of his life. His main responsibility now is family. Andrei’s assistant Yuriy will be in charge of the Rehab ministry. 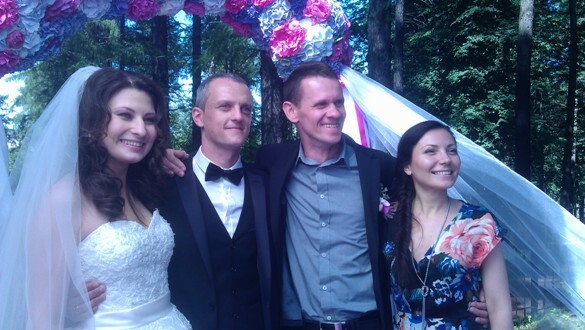 Andrei’s mother told me after the wedding, “I gave him life, then he lost it and you gave him back to us”. Praise the Lord for the transforming power of His life that makes all the difference! Since the beginning of this year we started a new outreach at the distant orphanage. Once a month we visit the orphans with the message of the Gospel, games and humanitarian aid. Here you can download some pictures from our April’s visit. Many blessings from the wonderful Lord who lives in our hearts! This entry was posted in For my English speaking friends. Bookmark the permalink.